Tie & Tide ( pvt) Ltd is well established Company for swim pool building for many years in Srilanka . Our primary focus is to define a luxury living through our pool construction service while creating high value to your backyard. Whether is indoors or outdoors, we specialize in building your dream pool without a high price tag. Our team is fully trained to be committed to using high quality materials with innovative technology. Having earned Customers trust over the past 15 years, we are very much happy to being able to deliver what we promised. Our service is more than just swimming pools building. It is one stop shop for range of services. In addition to pool construction, Our Company provides services and assistance including renovation and Maintenance. So you can always count on reliable, personalized, attention to detail service for years to come. Our Vision – Revolutionize the way our residents define luxury living through the enhanced backyard swimming pool experience. Our Mission – To provide detailed oriented, high quality, unparalleled serviceto our Customers complying with industry set standard. |building a pool is lengthy process and tough one to navigate. If you have any questions that we should answer, do not hesitate to contact us any time. We’ll guide you along the process of building your dreaming pool at a fraction of a cost. Below are a few of the common questions we get asked by our Customers, alone with answers for hassle free construction. How long does it take to complete a pool? Regardless of the weather,Tie and tide Pools builds pools year-round swimming pools. Why do Construction prices vary? 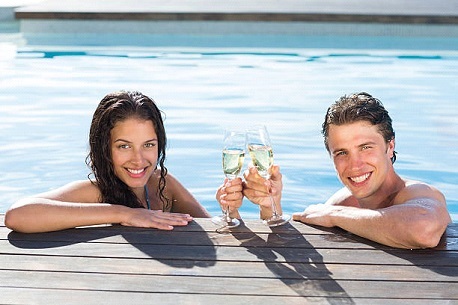 There are fewfactors that determine the cost of a pool. Size of the pool,design, how many extras features are added, materials quality, Soil conditionsetc. are mainly considered. However Tie and Tide Pools guarantees high quality of work in the industry at low cost price. Does your Company build pools for small yard, will you design a pool that suits my taste and budget? To our Customers Surprise, We have shown our expertise even in smaller yards. It reflects how well our experienced designers have utilized the space in its fullest potential with custom designed Pools. Nowadays majority of urban Houses are built in smallareas. Despite these challenges, we have strong designing capability to build magnificent pools in your backyards. Will you give us a warranty? Yes. We know that our reliable customer service does continue even after commissioning and handing over. At Tie and Tide Pools, We are responsible for a period of 10 years for the Construction and design defects of concrete shell and 01 year warranty period for manufacturing defects of Water Pumps and Sand filters from the date of installation. What features can I include to the pool? you can propose almost anything. Our team are experts in designing and building variety of features like water falls , fountains, grottos , jump rocks, , tanning ledges, water slides . Tell us about your preference we can do all. How much maintenance cost is involved for a pool? Upon the completion of construction, our team will give instruction as to how the maintenance work should be handled. However you can drop the maintenance cost significantly by installing a Salt generator. Please ask our representative aboutcost saving tactics. What shape of pool are recommended? When it comes to design and shapes, there are unlimited choices. Our Team will offer suggestions on the design and size according to shape of your space. At Tie and Tide Pools, we are fully committed to delivering what we promise. Regardless of the size and the budget. We can help our customers get the best service at all times.